Welcome to the home of the one and only Bipod Buddy since 2011! Don’t accept an imitation or knock-off. We have the experience, knowledge, professionalism, and customer service to get you the best product for your money. These rifle supports were designed to aid in shooting stability, precision, and extend the effective range of modern rifles. The need for such a product came from many frustrations while hunting in situations where taller bipods were needed to shoot over grass, brush, and snow. In these situations a typical benchrest size bipod can be difficult to use. However, the use of taller bipods can make it difficult to be as steady due to the lack of suitable rear support. For years shooters and hunters that wanted long range precision in the field had to use the smallest bipods, combined with sand or poly filled bags for a rear support. The biggest problem in using this system for hunting is that there is many times that even very small plants, grass, and snow prevent shooting at the intended target. Now with a Bipod Buddy, a rock steady hold and precise shot can be had with any size of bipod or shooting position. Even for shooters that prefer the small 6-9” bipods, the Lil Buddy is a great lightweight alternative to rear bags and monopods. Take a moment to look over the product line. 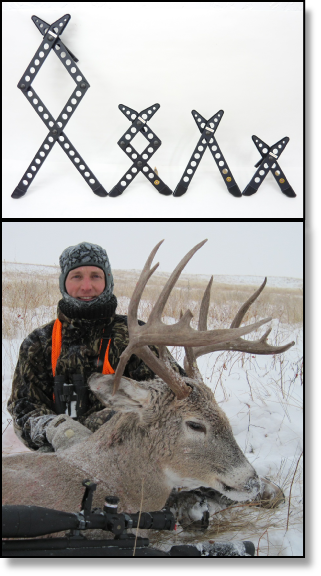 We are sure that there is a Bipod Buddy that can help make your future shooting and hunting a success. The Bipod Buddy products are made to last. All legs are machined from 6061-T6 aluminum anodized in a matte black finish. We know that you will love using the products, and want you to get a lifetime worth of use. Thus, all Bipod Buddy’s are covered by a lifetime guarantee to the original owner. They are guaranteed to be free from defect in materials and workmanship through normal use. It does not cover cosmetics, damage caused by abuse, or loss of parts. If you are unsatisfied with your product or need a different model, we will work with you to make sure you are satisfied. We also stock and sell Harris Bipods at competitive prices. One stop shopping for quality Made In America, front and rear rifle supports!